Cat.I and Cat.II Quick Hitch compatible. Has lower hitch clevis type mountings. : Makes for faster and easier hookup to the tractor. 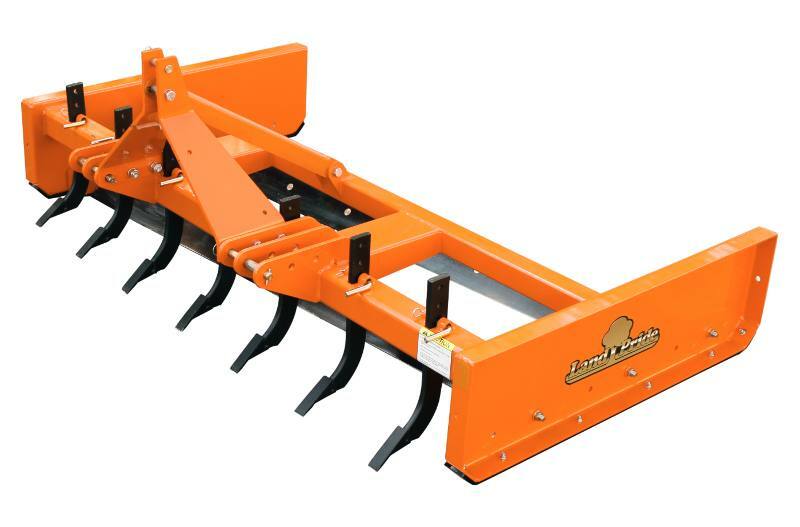 Dual adjustable height grading blades and optional 4-position scarifier shanks. 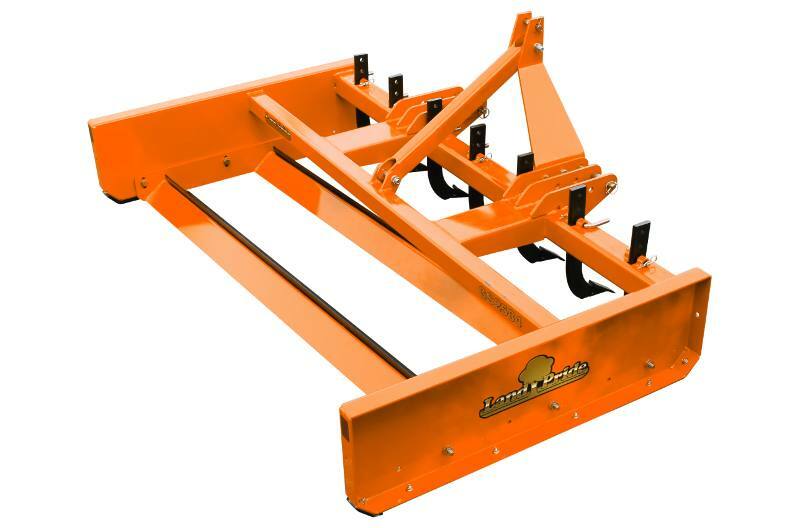 : Allows the scraper to be adjusted to desired amount of cultivation, leveling, and grading action. Skid shoes are constructed of high carbon steel: Extends the wear life of the skid shoes. 40-90 hp requirements Makes it compatible with many popular smaller sized and properly ballasted compact utility tractors in use today. Overall Width: 102 1/4 in. Unit Weight with Shanks: 917 lb. Overall Length: 56 1/2 in. Overall Height: 34 9/16 in. Side Panel Height: 14 5/8 in. Side Panel Length: 50 in. Side Panel Thickness Tractor: 1/4 in. Thick with 2 3/4 in. formed edges. Front Main Beam & Scarifier Support. : 4 in.x 4 in. x 5/16 in. Reinforced heavy wall tubing. Rear Beam Construction: 3 in.x 3 in.x 3/16 in. Heavy wall tubing. Skid Shoe Dimensions: 3/8 in. Thick x 2 3/4 in. wide x 50 1/4 in. long. Cutting Edges: Two 1/2 in. x 6 in. high carbon heat treated blades that are reversible and replaceable. Cutting Edge Placement: Two parallel grading blades positioned at a 5 deg. grading angle with 20 in. fore and aft spacing in. between leading edges. Cutting Edge Adjustment: Infinite vertical adjustment from level grade to 1 1/2 in. below grade. Shank Adjustments: 3 1/2 in. and 1 1/2 in. below grade level. 1/2 in. and 2 1/2 in. above grade level.